Even by modern standards of the larger-than-life celebrity Tommy Trinder is an acquired taste. Massively popular, both on stage, on radio and later television variety programmes, Trinder is paradoxically unique in his trademark mannerisms (not to mention his catchphrase ‘you lucky people!’) yet to some extent outside the major fame (and celluloid immortality) granted to those lucky enough to have been involved in the ‘Carry On’ film series or those who were solo attractions in their own right (such as Will Hay or George Formby). Unlike Hay and Formby, Trinder’s film career was very much ad hoc- he did not debut in films until 1938, and 1944’s Champagne Charlie marked the end of his serious box-office success. Although a handful of film appearances followed, Trinder’s career can be pigeonholed quite easily into a six year period which more or less spanned the war years. In common with many great British comedians, Trinder’s work has not been served well on DVD. In comparison, although the Will Hay films are now available, they do not feature any extras and are an un-collated mess spread across several releases. This Optimum box set is a refreshing way to have a concrete group of main titles, which, even though it lacks any real extras, offers a chance to see some titles hitherto unavailable. Unfortunately for any ‘newbie’ to Trinder’s work who decides to start at the beginning, the first included title- Save A Little Sunshine is without doubt the weakest, being an excruciatingly unfunny lesson in acute boredom with an actor named Dave Willis being particularly annoying. If one can opt instead for Sailors Three, there is rich reward to be found. A typically patriotic flagwaver from Ealing Studios, this 1940 film unites Trinder with the ever-endearing Claude Hulbert and the superb Michael Wilding in an uplifting yet rousing piece which is surely Trinder’s finest hour. Despite being a mere two years later than the 1938 opener to the box set, Sailors Three is sparky and genuinely amusing unlike its counterpart Save A Little Sunshine which is to be avoided at all costs. The success of Sailors Three has ironically little to do with Tommy Trinder and much to do with his co-stars: the former’s breeziness is not as dominating as it is in some other films in this collection. The war years are well represented- The Foreman Went To France (1942) is closely followed by Fiddlers Three (1944) and The Bells Go Down(1943), whilst the lesser-known Bitter Springs(1950) is a pleasing inclusion. These films are standard Tommy Trinder fare, and worthy of merit as examples of films that featured a popular star appearing in popular films. The set is rounded off with Champagne Charlie (1944), an unfortunate finale for it features Trinder as George Leybourne, a Victorian Music Hall star. Bearing absurd sideboards and with a breeziness that is highly irritating, Trinder’s over-acting is tempered by the brilliantly understated, aloof performance by Stanley Holloway and a naturalistic one by Betty Warren. The supporting cast also contains fine performances- notably from Harry Fowler and Austin Trevor. Once again, the star of the show, for all his bluster, is outclassed by his co-stars. Clocking in at 105 minutes, Champagne Charlie is also rather an effort- given its pedigree (an Ealing film directed by maestro Alberto Cavalcanti) it should not be, but its time is tantamount to that of the unimaginably awful Save A Little Sunshine- it feels much longer than it actually is. Given that, in terms of releasing its national heritage, America is virtually in the home straight whilst its Transatlantic companions are still stuck in the starting-blocks, any effort to release archive films is welcome. The major advantage of doing so is that myths can be dispelled, minor treasures discovered and reputations enhanced. For someone like Will Hay, whose movies are still genuinely funny and joyous experiences, the availability is something to be savoured. For Tommy Trinder, the emotions are somewhat different, but his movies still deserve to be seen, if only to redress the balance. This box set is unlikely to appeal to the modern audience (with a few exceptions, such as the mesmerisingly brilliant Sailors Three, but it should appeal to those for whom Tommy Trinder’s ebullience was all part of his charm. 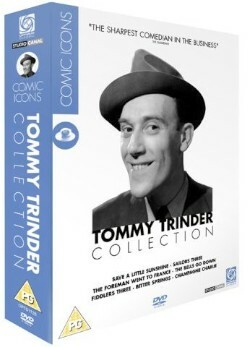 Comic Icons- The Tommy Trinder Collection is available from Optimum Home Entertainment.